Taking the Grand Kids away can be extremely stressful and tiring, but on the other hand, if you follow the simple tips below it could be an enjoyable and memorable experience for everyone. Pack a small number of their favourite toys and games, this should keep them amused during travelling and quite points. A pack of cards, story books and a portable DVD or music player are also great ways to keep them amused and calm them down. It can be tempting to take the kids somewhere they will love, but this could end up simply wearing you out. Try to pick a resort and destination that has something for the children and something for you. For example a great pool or a lovely beach, that way everyone will enjoy themselves and get a real holiday. Remember that children need their own passports now, and while they are under 16, their passports will only be valid for five years. Make sure they have a valid passport before you travel. Make sure the entire group have invested in quality travel insurance. 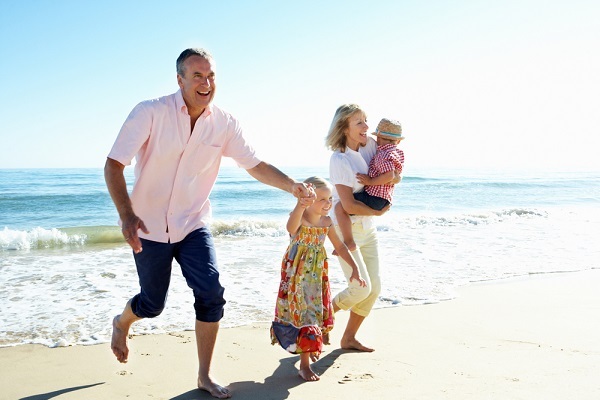 It is absolutely vital that you invest in travel insurance to protect your grandchildren whilst away. It will be a lot cheaper, and at least you know they will like the food. However when it comes to dinners, I would definitely suggest getting them to try something new, make it fun and they will enjoy the discovery. Keep an eye on your Grand Kids at all times, especially if they are playing in water or away from you. Most importantly, simply enjoy spending some quality time with your grandchildren!